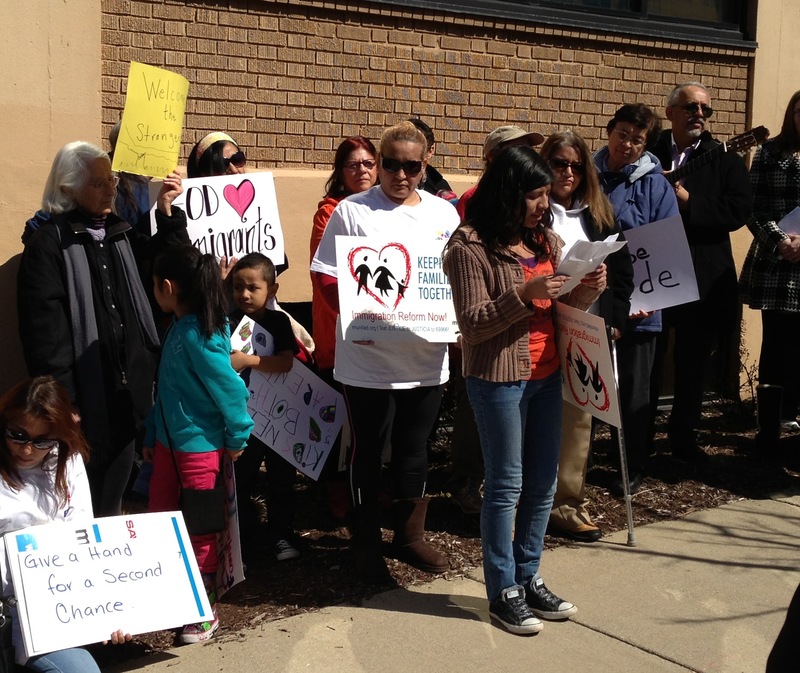 About 100 people gathered on Friday to protest ongoing Immigration and Customs Enforcement (ICE) raids against immigrants in West Michigan and to kick off a local campaign to mobilize people to prevent raids in the future or to intervene on behalf of people arrested by ICE. While Mlive has done a piece on the protest, much valuable content was missed, including a basic understanding of why the demonstration took place. Below is our report. 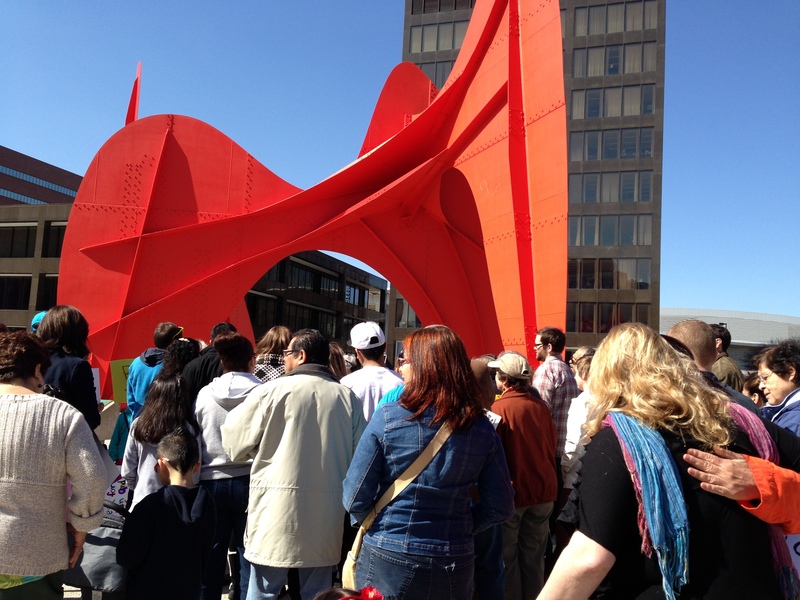 The demonstrators initially gathered at Calder Plaza in downtown Grand Rapids, where Joyce Herdog led the group in prayer. The Dominican sister ask that folks remember that Jesus’ love was universal and that he “made no distinctions”. The group was diverse and all present were asked to “stand in solidarity” with those facing deportation, arrests, and intimidation by ICE. One organizer made a point to welcome any police or ICE officers that might be present at the march, saying “We’re not afraid of you, and we won’t be intimidated”. Helicopters whirled overhead. The recurring echoes of chopper blades bouncing off nearby buildings served as an ominous reminder of our current surveillance state and the dangers those people designated as “illegal” face. Protestors participated in a silent march to the ICE office at 517 Ottawa Avenue. Organizers asked folks to “circle up” on the sidewalk outside of the office windows to ensure visibility from inside the office. 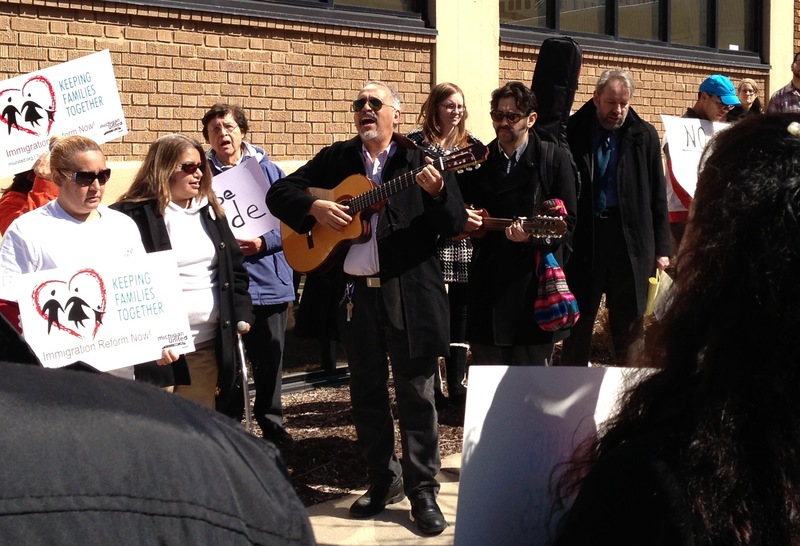 The group sang together before several people gave testimonies of their experience with ICE and why they decided to participate in the protest. Two women shared testimonies in Spanish about family members that have been arrested, detained, and deported by ICE officials. Both women talked about the hardship of being separated from the family members who were deported and how difficult it has made their lives. Local immigration attorney Rick Kessler spoke about how many raids have been taking place in West Michigan and how most of those picked up in ICE raids have been people who committed petty crimes, often over 15 years ago. Kessler said that the ICE budget has expanded and is now larger than many other law enforcement agencies combined. Kessler also made the point that these arrests are political in nature and have little to do with public safety or security. A representative from Justice for Our Neighbors (JFON) also addressed the crowd, speaking about the services their organization provides and the importance of working for Comprehensive Immigration Reform at the federal level. There were two organizers with AIR-MOP, a statewide group that is working on Comprehensive Immigration Reform. Both talked about the policies that need to change and the national campaign to make those changes. They also spoke about a large demonstration that will take place on April 10 in Washington, DC, with several bus loads going from Grand Rapids. 4) Mobilize people to rapidly respond to ICE raids using a variety of political pressure tactics. The group has said they will soon be creating a Facebook group and email listserve to help raise awareness and keep people involved.